Banes Cottage @ Hindringham Hall01328 878226work Self-cateringCharming old traditional brick and flint cottage with central heating and an open fire. Surrounded by its own grass Banes is the perfect spot to relax and unwind. Situated within the beautiful peaceful grounds of Hindringham Hall yet just 10 minutes from the North Norfolk Coast and easy access to all that Norfolk has to offer. On the ground floor there is an extremely well equipped kitchen and sitting room with sofa and open coal fire. There is a scullery housing washing machines, recliners bbq etc. Upstairs there is a double bedroom with adjoining bathroom and twin bedded room with ensuite shower room. For the active there is a hard tennis court, for the dog owners a walk from the door ( altho the garden is NOT fenced} and for those that just want to chill out – the perfect spot. 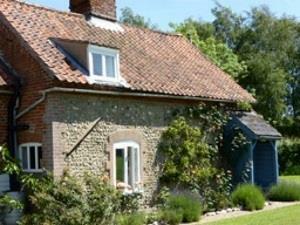 Charming old traditional brick and flint cottage with central heating and an open fire. Surrounded by its own grass Banes is the perfect spot to relax and unwind. Situated within the beautiful peaceful grounds of Hindringham Hall yet just 10 minutes from the North Norfolk Coast and easy access to all that Norfolk has to offer.